Irish Christmas ornament features the Claddagh symbol and it is enhanced with a filigree design. This Irish ornament is ready to hang on your Christmas tree with the included cord. This Claddagh Christmas ornament features the iconic Irish symbol repeated three times in gold. 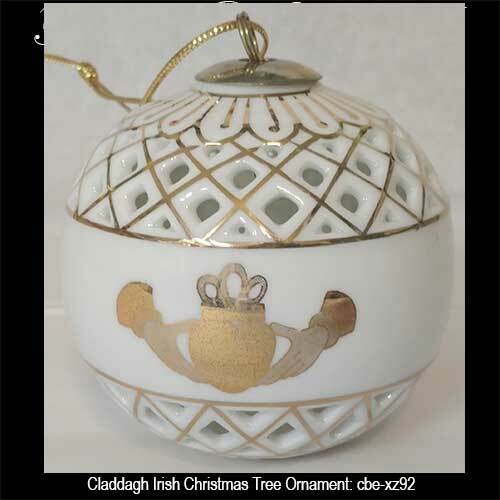 The Irish Christmas ornament is made of white porcelain that is enhanced with gold accenting and it features a diamond cut filigree design. The Claddagh bauble measures 3 1/4" diameter. The Irish ornament is gift boxed with a Claddagh history card, complements of The Irish Gift House.